Dexster is a perfect audio editor tool for your music production that supports many popular audio formats. 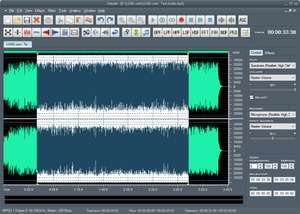 Dexster allows to edit an audio file visually; apply different effects; Insert noise and silence; Vocal Reduction;Mix Stereo;Insert marker; Apply filters; Record audio file; Convert audio file from one format to another; Extract audio from video. Dexster supports WAV,MP2,MP3,VOX,Audio CD,Windows Media Audio (*.WMA),RAW audio,MPC,Windows AVI (*. Dexster 4.6 is a shareware program and can be used as a demo to try the software until the free trial period has ended. A full version of the program is available after the trial period ends. For security reasons, you should also check out the Dexster download at LO4D.com which includes virus and malware tests. Additional screenshots of this application download may be available, too. Dexster has a presence on social networks.